JSC “Alfatransa” business concept is to pay special attention to regular training of the employees, qualification improvement and implementation of advanced technologies. We are responsible and dynamic, so we do not only follow all mandatory safety requirement, but we also take initiative to ensure comprehensive provision of safe and high-quality transportation services. 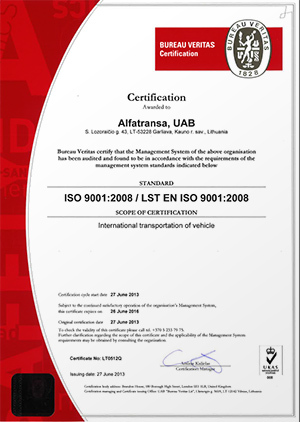 The Company management is certified according to the requirements of ISO 9001:2008 standards. Efficiency of the management system has been improved permanently, considering the activity results, offers of the employees and replies of our clients and partners. © 2015 ALFATRANSA. ALL RIGHTS RESERVED.